The South Porch Enter the church by the south door, over which there is sundial, with the Latin inscription "God's Law is the Light of Day". The pinnacles and battlements were added in the mid 17th century. Richard Porter paid for the building of the elaborate two storey block which comprises of the south porch, the vestry and an upper room which from 1665 to 1857 was a school for poor boys. On the outside wall near the blocked entrance graffiti can be seen done by the children. The Nave Moving clockwise we reach the central part of the church, the nave. The early Norman arcades, in two bays, have rounded arches and transitional capitals. On the corbels are the crowned heads of Henry II (1154-1189) and Queen Eleanor of Aquitaine. During their reigns this part if the church was begun. The uncrowned head nearby may be a benefactor or master mason. During the 14th century the two pointed arches at the west end of the nave, the two side aisles, and the tower with its ribbed and broached spire which is 90 feet in height were added. The Organ The organ loft was constructed in 1931 with a small choir gallery in memory of her parents by Miss Mary Graves Hamilton. Holdich of London built the organ in 1853 at a cost of £120. Extensive Victorian restoration took place in 1868 by Frederick Preedy, a local architect. 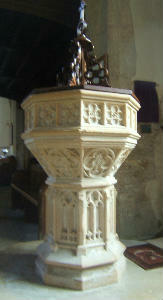 The Font The pedestal is 15th century and its octagonal bowl dates from 1661. In the north aisle there is a 15th century ironbound chest, a second chest of iron dating from 1700, a Charles II Bible box in old English oak, and a two-sided stone crucifix on the windowsill. This crucifix dates from 1200 AD and was dug up near the south door in 1865. The window above displays armorial designs of the Graves family and their hatchments hang on the north wall. Richard Graves bought the Manor from the Fishers in 1656, and his descendants owned it until 1977. The lectern is another Graves memorial. Two members of the family (father and son) are on the list at the back of the church of clergy who have served here. The Pulpit The pulpit is a carved Jacobean piece. It is recorded that John Wesley preached here on one of his evangelistic journeys. The Chapel and Sanctuary Above the High Altar the east window shows the Passion Death, Resurrection and Ascension of Christ in Munich glass. The millennium icon of Christ is seen above the credence table. The tabernacle where the consecrated bread and wine are kept can be seen to the left. The Altar Rails The intricately carved altar rails are 17th century with communion symbols. The Fisher family window with their motto "Vigilet qui Vincet? which means "Let he who would overcome keep watch. The glass is 17th century Flemish or northern French. Sir Edward Fisher bought Mickleton Manor in 1600. The South Aisle A carving above the statue of Mary and Jesus represents a fight between dragons and worms. A wooden carving of St Lawrence is above the vestry door. Above the south door are some boards on the wall listing some of the village charities. 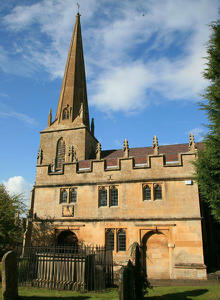 Among the benefactors are Richard Porter and Anne (Nanny) Millard. The Communion Vessels The Church has an elegant chalice of silver gilt with a steeple lid bearing the hallmark of 1613 and a patent of 1656 which is kept in Gloucester Cathedral treasury. The Tower Clock The clock is 100 years old and once had a carillon. The Bells The tower has a ring of eight bells. In 1954 the bells were retuned and rehung in an iron frame. In St Lawrence's church stands a chest. I only realised it was there a few months back. (It was completely covered with an old dust sheet, on top of which were children's books and toys.) But local people knew about it, right enough. They were aware too that it was locked – and that no-one knew of a key for it. Some people were hoping it might contain old legal papers relevant to n unresolved property issue. One of our older members recalls, from his own younger days, a (then) very old man saying just such papers may have been inside it. We needed the help of a locksmith to gain access. On top was a pile of several dozen newspapers, the Times, and others no longer published, both national and local. The most recent date was 1901, this newsprint horde going back into the 1870s. They appear to have been saved because each records details of some notable national event – including Queen Victoria's funeral procession and the death of Prime Minister William Gladstone. Next, there was a large pile of receipts and dockets, small items of paperwork relating to the settlement of estates, mainly of members of one particular family. Perhaps this was an ‘executor's bundle'. Then, there were much fuller copies of legal documents, conveyances, leases, rent-agreements and the like, going back in some cases as far as 1787 and – again – many of them relating to the same local family. Finally there were three other items of considerable interest: two of them ‘Day Books' dating mainly from the 1880s and used for accounts – but each of them also including day-by-day notes about the weather and other passing matters. The most charming of all the contents, though, was a child's note-book dated 1812, in which a young girl had made copies of a letter and various poems: some of which she may have composed herself. Very small, slight, fragile, it is a fascinating document. Nothing in the chest has a date more recent than 1901. It is entirely possible that it was slammed shut in that year and has not seen the light of day since: but that must be a matter of speculation. The documents will in due course be deposited at Gloucester County Records Office but in the meantime we hope that some members of CADHAS with archive experience may look through the collection and make a catalogue of what is there. The chest itself is where ‘Armada' comes in. Made in south Germany, or possibly the Low Countries, in the 16th or 17th century, its proper name is a Nuremberg Chest. Its main defining feature is its locking mechanism. One key operates ten heavily-sprung latches, via a complex and sophisticated system of levers. Our Victorian forefathers coined the now widely-used term ‘Armada Chest'. Why? Because it tickled their romantic fancies to think that this was just the kind of box the Spanish would have used for their treasure!